Canadian Daily Deals: Walmart's Cyber Monday Flyer is Now Available! 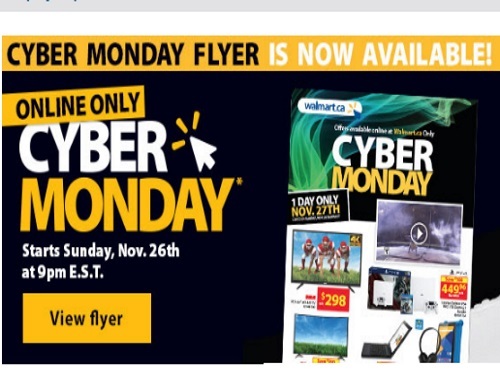 Walmart's Cyber Monday Flyer is Now Available! Walmart's Cyber Monday flyer is now available! Browse the flyer in advance to plan what you want to buy so that you don't miss on getting it! Offers start online only on Sunday, November 26, 2017 at 9pm ET. Click here to browse the flyer.